Craftsmen welders across the country were asked to help create the next generation welding helmet. The result: new Fibre-Metal FMX™ - premium quality welding helmets, with the Xtra features welders want. Fibre-Metal unveils their FMX™ welding helmets designed by and for craftsmen welders. The FMX™ welding helmets feature the finest graphics on the best fitting – most comfortable and durable shell and headgear available. FMX offers the highest optical quality Auto Darkening Filter lens on the market. Backed by a limited lifetime warranty on the headgear and shell, FMX is the only welding helmet you'll ever need! Custom Graphics: These are NOT stick-on decal graphics you've seen on other helmets! Selected by craftsmen welders who told us what they wanted on their helmet, FMX welding helmets offer the best, most highly detailed graphics available on any welding helmet. The proprietary graphics are printed onto a clear glossy polyester sheet and then thermo-formed on to the shell of the helmet. This exclusive process not only provides a glossy, high luster surface finish but it protects the graphics from radiant heat, welding spatter, scratching, chipping and peeling. These are NOT kiddy toy car type decals! They are the real thing – built into the helmet, made to last over the long haul. FMX welding helmets are the lightest weight, full sized welding helmet available. Sleek, narrow shell design offers the ideal in modern welding helmet style without compromising room for eye, respiratory and hearing protection. Quality: FMX welding helmets outlast typical nylon shells by 2 to 1! FMX helmets outlast typical nylon shells by 2 to 1! 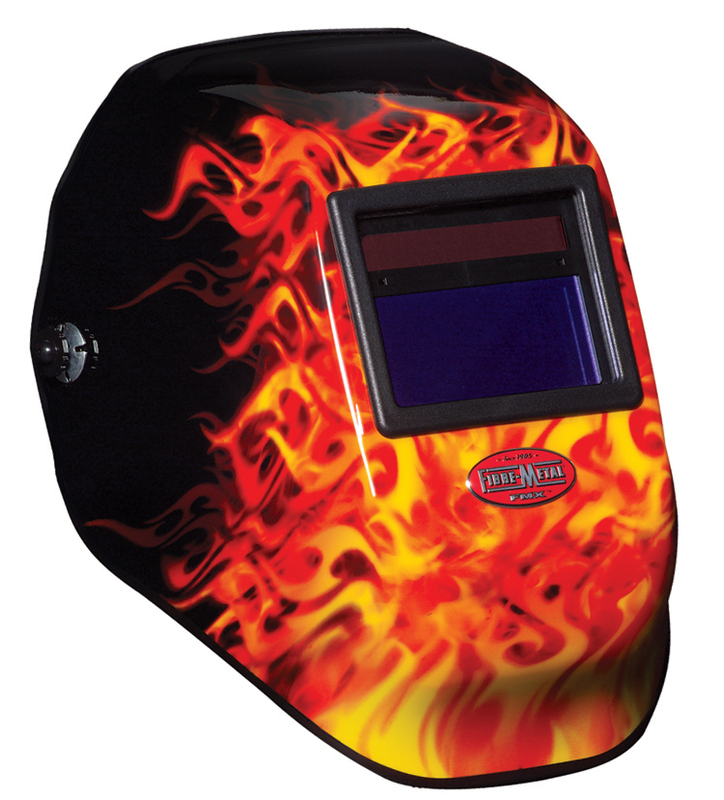 Powered by a welding arc, the Auto Darkening Filter lens on the FMX welding helmet is solar powered. A solar powered ADF Lens offers the user a no batteries solution that provides cost savings and reliable performance. The ADF lens offers the highest optical quality and works the first time and every time you use it. Fibre-Metal offers a limited lifetime warranty on the helmet headgear and shell, and a two year limited warranty on the replaceable ADF lens – making Fibre-Metal FMX the only welding helmet you'll ever need! Born in 1905, the first welding helmet was fabricated at Fibre-Metal by a welder craftsman. In 2007, Fibre-Metal introduces the FMX series welding helmets, designed by teams of master welders to be the very state of the art in custom welding protection. FMX welding helmets define what craftsmen welders want, we know because they told us. To learn more about the new Fibre-Metal FMX welding helmets, contact Fibre-Metal, a North Safety Products brand, at 888-422-3798 or marketing@northsafety.com.